The decentralized ecosystem is emerging from the infrastructure phase, and entering a phase of actual utility. For most apps that people rely on in today’s Internet, there is a decentralized version of that app (also known as a dapp) that is growing more useful and popular everyday. We believe it is critical to drive everyday users to dapps that are ready for widespread adoption. That’s why today, we’re announcing the first ecosystem-wide universal Dapp Store. 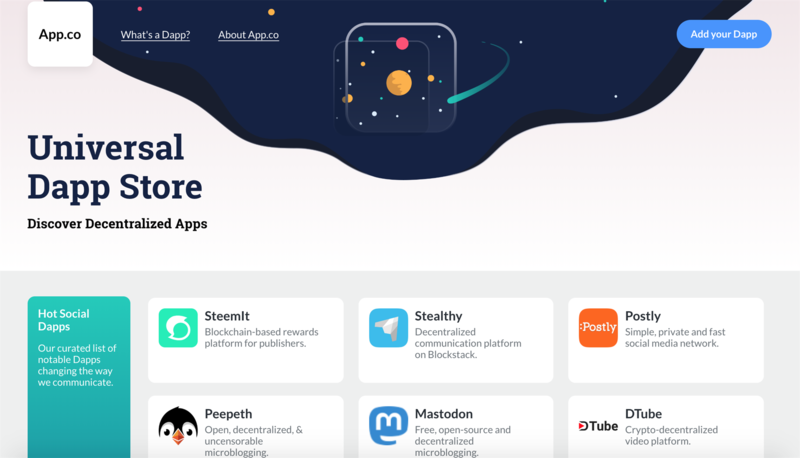 The Dapp Store is a discovery tool for decentralized apps built on Blockstack, Ethereum, EOS, IPFS, Steem, and more. It is launching with over 150 dapps for everything from gaming to finance, and we expect more to surface every day. Currently, dapps are accessed through a myriad of different channels, creating a bottleneck for people wanting to discover the best of what the decentralized Internet has to offer. The Dapp Store will help users discover apps from a convenient place and gives developers an outlet to feature their dapps to potential new users. We’re excited to hear about your favorite dapps and support creators and users alike with this effort. You can find more details about The Dapp Store, including what qualifies as a decentralized app, where we intend to take the platform with the community, and more in our blog post announcement. Find decentralized apps and submit your favorites.